The Lord has given me a disciple's tongue. So that I may know how to reply to the wearied he provides me with speech. Each morning he wakes me to hear, to listen like a disciple. The Lord has opened my ear. For my part, I made no resistance, neither did I turn away. I offered my back to those who struck me, my cheeks to those who tore at my beard; I did not cover my face against insult and spittle. The Lord comes to my help, so that I am untouched by the insults. So, too, I set my face like flint; I know I shall not be shamed. The Gospel today is the Proclamation of the Passion of Our Lord Jesus Christ according to Luke. English speakers use a variety of non-English expressions that have been assimilated into spoken English - for example, 'pied- a-terre', from the French, meaning an occasionally used residence. Another example would be 'alleluia' which has Latin as well as Greek (allelouia) and Hebrew (halleluyah) roots meaning 'praise the Lord'. Sometimes, too, people speak English words without fully appreciating what they are truly saying. For example, take the English epithet 'bloody', which originally meant 'by Our Lady'. Do people, using this word, understand that they are actually calling on the help of Mary, the Mother of God? The general public refers to Palm Sunday with little, if any, understanding of its religious significance for those who believe in Jesus Christ. 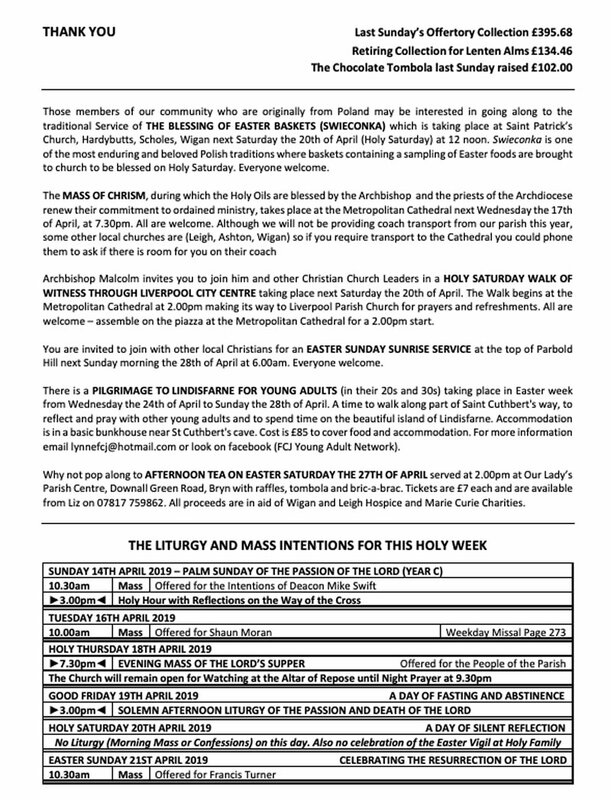 Even among the Baptised, Palm Sunday, like most Sundays of the year, has been subject to the corrosive inroads of rampant commercialism and employment undertakings resulting in it no longer being recognised as the Lord's day. Little surprise then that the title Palm Sunday no longer calls to mind for many the history of the final week upon this earth of Jesus Christ, God-made-Man. The shell of a person's 'anaesthetised' spiritual life is preserved by a powerful appetite for continuously renewed sensory pleasure. The infiltrated conscience is fed a falsehood of 'tomorrow', 'you are only human', 'everyone's doing it'. But the preserved shell cannot hide from its inner deception when a person looks in their soul's mirror, the conscience. Just as collectors of rare birds' eggs show infinite patience in ensuring that the shells sustain no damage in the slow exchange of content, so too with Satan. He plays the long-game; taking care not to alert or alarm us as to what he is about. Emotions that are superficial, of the moment, are just that. They suffuse the surface of our lives with excitement but, like Jesus' parable of the sower and the seed - carried by the Synoptic Gospels, Matthew 13:1-23, Mark 4:1-20, and Luke 8:4-15. - they lack significant depth. Momentary happiness can dissipate as promptly as it arrived. In just five days, the Jerusalem crowd's Palm Sunday 'Welcome' to Jesus had been refashioned into 'Crucify' by Good Friday. We, too, live our lives in the, sometimes, thrashing entanglements of human relationships. We can visit the heights of elation and the depths of despondency in frighteningly short lapses of time, thanks in no small part, these days, to modern media. The dependency of the Baptised upon the balancing Grace of the Holy Spirit becomes ever more marked. Holy Week for Christians is the most significant period of the liturgical year. How we weave evidence of this into our daily life as a help to those whose lives we share is a crucial ingredient of our Baptismal vocation. 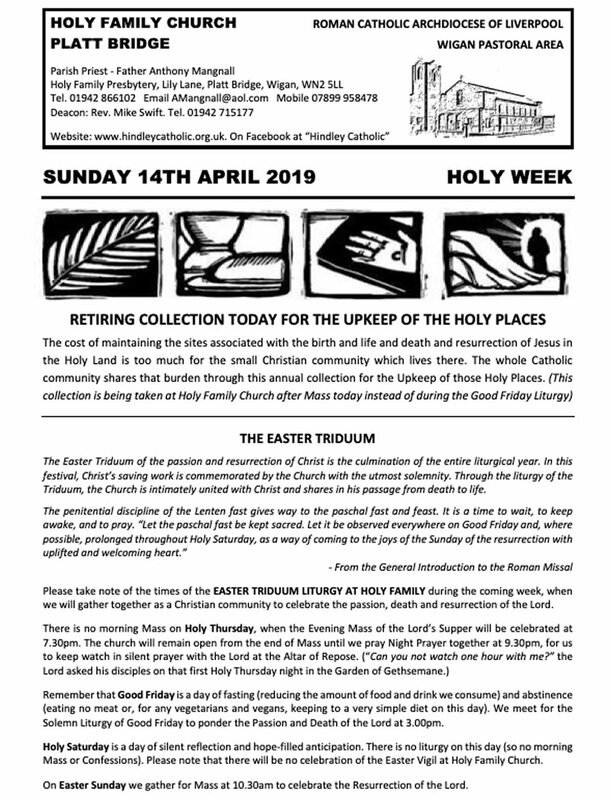 The way we live Holy Week should give public evidence of the reverence in which we hold this week. Our Muslim communities have captured the attention of the wider public by their devotion to the month of Ramadan. Surely, as Christians we, too, must re-engage with the wider public. The highly lamentable moral corruption of minors perpetrated by some of our Catholic brothers and sisters must not be allowed to reduce us to silence and invisibility. As a matter of interest, if you are a regular listener to BBC Radio 4's 'Today' programme, when was the last time you heard a contribution from a UK Catholic bishop? Their Anglican counterparts are regularly heard. It is not, so I am led to believe, that the BBC has not invited them but rather that such invitations, when made, are declined. Perhaps a fitting prayer-thought for our entry into Holy Week would be: "Help us, Lord, not to choose convenience over conscience."